In Nature, everyone has the innate ability to heal and relieve pain. With PRANIC HEALING, you can easily learn to cultivate and awaken this power within you to help yourself and others in a very short time. It is easy to learn. Any relatively healthy person with average intelligence, the ability to concentrate, that has an open but discriminative mind and a certain amount of persistence can learn PRANIC HEALING. Pranic healing utilizes prana (ki) to accelerate the body`s ability to prevent, alleviate, and heal a whole spectrum of physical and mental ailments. In the palm of your hands are energy centers called chakras. These chakras can be activated. Once activated, these chakras will become sensitive to feel other`s energy. You can scan that energy field to locate blockages and be able to cleanse, energize and revitalize the area with new prana. You will also learn techniques to stop the drain of energy on your body that many health practitioners experience while working on others. You will actually energize yourself while you are healing someone else! 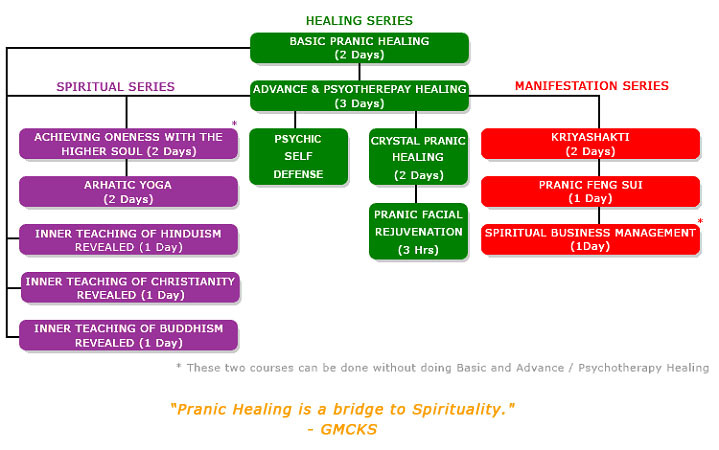 This is the basic and introductory course in the Pranic Healing. It is an experiential course to discover one's innate ability to heal. Advance Pranic Healing is a specialised workshop for those who wish to become more effective healers and those wanting to effectively treat serious ailments using colourtherapy. Pranic Psychotherapy offers you the ability to quickly and safely release negative thoughts and emotions like fear, anger and resentment that may be limiting you from your greater potential. Pranic Crystal Healing is rediscovering the wonderful and practical uses of crystals and gems stones to enhance your healing ability, spirituality and prosperity. Pranic Psychic Self Defence teaches you scientific ways of utilizing pranic energies to properly protect yourself, your belongings, surroundings and loved ones. Achieving onesss with the higher soul means discovering the nature of your soul and its secrets of reincamation. Arhatic Yoga is a synthesis of techniques designed to help you develop spiritually. When you practice Arhatic Yoga regularly, as you advance, you will achieve Self-Mastery. Arhatic Yoga activates and balances the negative properties of the chakras and neutralities your negative tendencies. Your life will become calm not chaotic. Arhatic Yoga is not a religion. You are not asked to change your religious beliefs. You simple become a better Hindu, better Buddhist, better Christian, better Jew, Better Taoist or better Moslem. Your soul will be in charge of your thought, your emotions and your actions. "Arhatic" derives from the work Arhat, which means "a perfected one" or "a highly evolved being". According to Dr. K.D. Pradeep, one learns to identify the energy, to receive different energies and use them for healing in the first level course. In the second level, you increase your healing power and, in the third, you learn to use the system for psychotherapy. The next stage is devoted to developing spiritual powers. Major areas of specialization with certifications awarded. Please contact us directly.